At Eden Mobility we pride ourselves on our Customer care and support. We have a commitment to working for the community and over the past 21 years we have helped thousands and thousands of people to become more mobile, to be more independent and to regain their freedom through their mobility. Eden Mobility was started in February 1998 by long term business partners of over 25 years, David Hughes and Karl Howe. They started Eden concentrating heavily on the servicing of Scooters, Powerchairs and Stairlifts and offered an excellent fast, efficient aftercare service. Their customers depended entirely on their equipment bought from them, so David and Karl knew it was vital that they got this side of the business right from the start. Word soon spread about Eden’s services, so much so that the two partners opened their first showroom in Bentley, Doncaster. This was soon followed by several others across the country and by October 2012 their Expansion plan was in full swing with over 20 stores working to help their loyal customers. They believe it is important to offer a top class all round service to all their customers, and have highly trained staff who listen carefully to what their customers require and give them honest opinions and good advice. 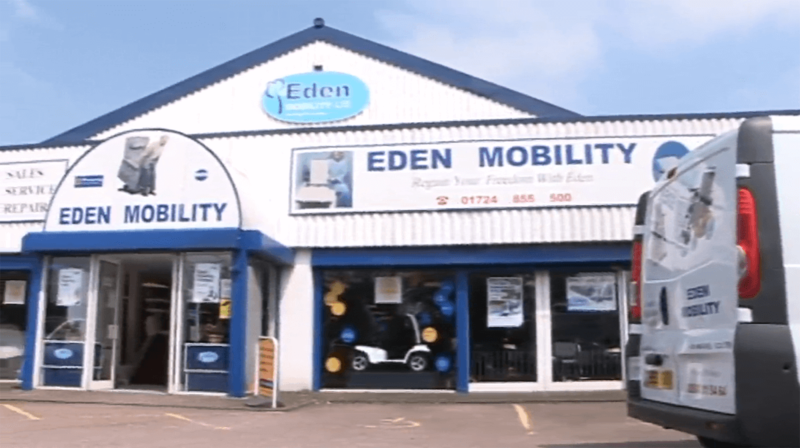 Thanks to all their hard work and all their loyal customers, Eden Mobility is now the UK's largest mobility retailer, with 31 stores throughout the UK, employing over 128 staff with a turnover in excess of £11.5 million and a customer base growing at 4500 per month, which is now standing at 200,000 plus. Karl and David want to send out a huge thank you to everyone who helped them get this far and hope the support will continue for years to come. Remember: Regain your Freedom, with Eden!